Spain did not need their best players to beat India but then they are taking the World Group Davis Cup play-off tie very “seriously”, bringing a strong 20-member contingent to tackle the lower-ranked home players. 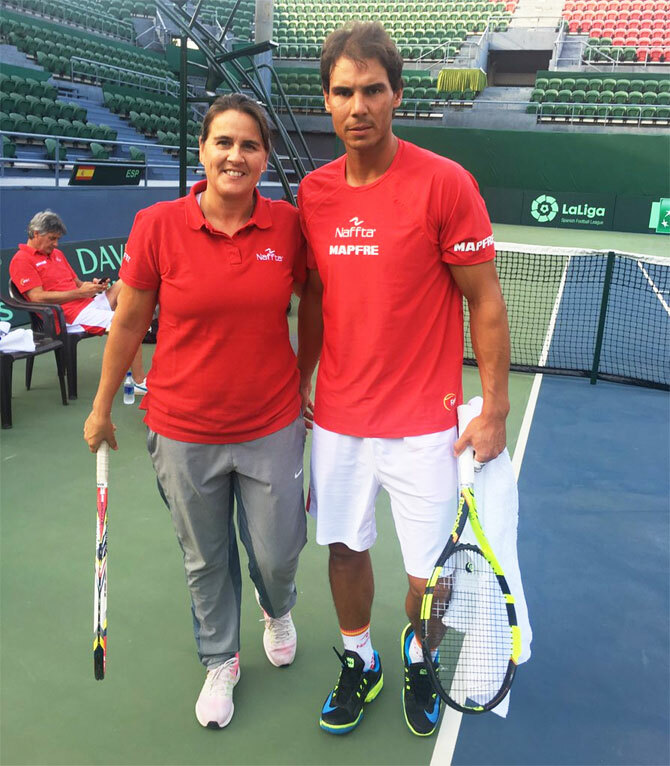 Led by World No 4 Rafael Nadal, the Spaniards landed in New Delhi on Monday morning and hit the courts in the evening. After watching Nadal and David Ferrer indulge in an intense session lasting 90 minutes, it’s easy to conclude that India will have a tough task on hand. The Spanish duo hit the ball clean, flat and with such ferocity that it never looked like a practice. India’s Saketh Myneni (ranked 137) and Ramkumar Ramanathan (ranked 203) are set be exposed to some high quality tennis and they have only to gain out of this experience. Asked if he preferred the timing of the tie (it will be played in the evening), the 14-time Grand Slam champion, covered in a sweat-soaked T-shirt, said it was “very necessary”. Nadal’s take further vindicates Indian captain Anand Amritraj’s stance that India have sacrificed the home advantage by setting the ties scheduled for evening. When asked what made Spain bring all the big names for a tie against not so tough opponents, Nadal said winning the World Group place back was a “motivation”. “I am representing my country and that’s always special motivation. There’s always confrontation when you are not playing at home, so difficult. India have a good team, it will be tough. They will be playing at home in front of a home crowd in conditions they chose. “We have lots of good players in top-100. It’s tough for us not to be in World Group, so we are looking forward to coming back to the World Group, and that’s the chance to win here, it’s not going to be easy. We need to be ready and play our best,” he said. Nadal expressed satisfaction with the speed of the courts. “It’s not very slow and not very, very fast. Good court to play good tennis,” he said after the session that was supervised by their captain Conchita Martinez, the 1994 Wimbledon champion and winner of 33 WTA singles titles. In the 20-member contingent, Spain have one doctor, two physios, one sparring partner. Each playing member has come with his personal trainer. Fernando Fernandez-Ladreda Aguirre, the President of the Spanish Tennis Federation, has also accompanied the team. Spain are out of world group since January 2014 when they lost 1-4 to Germany in the first round. They have been striving in the European\Africa zone since then. With Nadal in the city, the DLTA was abuzz with excitement. Security officials kept the fans away from the centre court but many DLTA officials gathered to watch the tennis star in action. Nadal also obliged a few people with selfies, moments after finishing his training session.